OVERVIEW: The Whirlpool GS6NBEXRB had some problems in ourinitialtesting with keeping a constant temperature. The doors inparticular seemed susceptible to excess moisture build up as well aspoor temp control. Needless to say, it almost didn't make ourlist. However, when we tested a second unit, it passed withflying colors. So, that tells us that consistency for thisproduct might be something to look out for. STYLE: This Whirlpool Side by Side refrigerator has asimplified look that appealed to our test group. 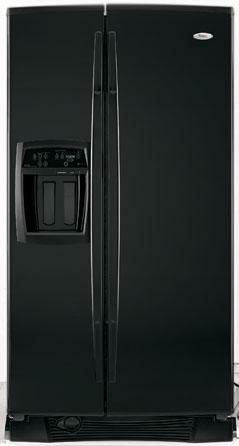 We find thatthis refrigerator can fit in any number of kitchen styles. CAPACITY: It has a 25.6 cubic foot interior which wasmore than enough room for most four person families and has anexcellent use of space. NOTABLE FEATURES: Mostof the features worked well such as the ChildLockout, EZ Touch Crushed/Cubed Ice Dispenser, PuR Filtration System,Humidity Controlled Crisper, SpillGuard Glass Shelves, AdjustableTaller Clear Gallon Door Bins and the Whirlpool Accu-Chill TemperatureManagement System. The ice maker water supply tube froze upon us in our first test, but we might have had a lemon because thesecond performed beautifully. COLORS: It comes in Black on Black, White on White,Satina (Stainless look), Biscuit on Biscuit and Stainless steel. Both of the models we tested were black on black and wedidn't care for the way the Satina looked on this particular unit. EFFICIENCY: It’s Energy Star qualified which will not only save you on your electric bill, it will also entitle you to an Energy Star Rebate. DIMENSIONS: Its dimensions are: DEPTH – 333/4in, WIDTH – 35 3/4in, HEIGHT 69 3/4in.